Junior Varsity is our middle school Bible study group held Wednesday nights at 6:00 for grades 6-8. 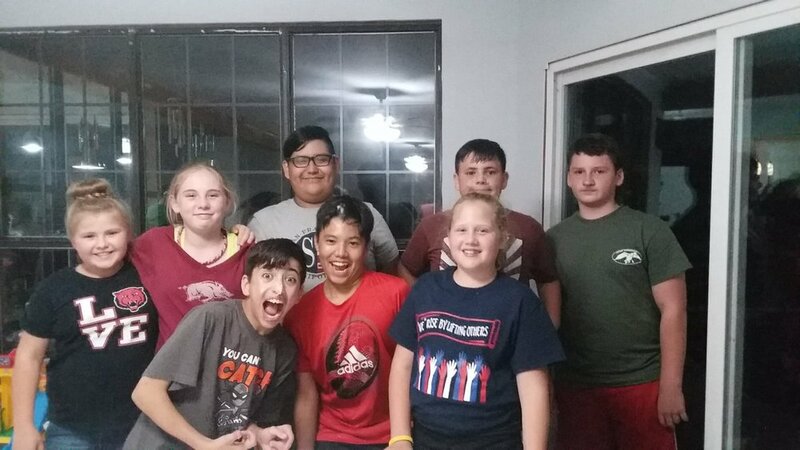 The leaders, Jose and Kathy Perez, have been leading this group of students in Bible study and fellowship for several years. On warm spring and summer evenings, you may find them in the Perez' pool playing games. In the winter and fall, they may be indoors having relays. Even though fellowship and games is a big part of JV, the emphasis on learning to have personal devotionals daily and learning God's Word while applying it to their lives is the main focus. Through modeling, encouragement, and sharing these middle school kids are preparing themselves for a life of service to God and those around them. Varsity is our high school group held on Wednesday nights from 6:30-8:30 for grades 9-12. These high school students are led through in depth bible study focusing on applying God's word in their lives and supporting one another through the pressures of the high school years. You can often find them beginning the night playing basketball or kickball in the game room at our church building and proceeding with worship and bible study throughout the rest of the evening. They serve a week each summer in a mission project. They are encouraged to use what they learned in JV on a deeper level through high school by using their spiritual gifts in some capacity in our local church body.